The project consists of 740c.y. of concrete footings, 788c.y. of walls, 67,000s.f. of slab on grade, 59,000s.f. of slab on metal deck, 21,000s.f. of sidewalk and miscellaneous other site concrete. The total yardage of concrete was 3,500c.y. The project consists of 52c.y. of concrete footings, 70c.y. of walls and grade beams, 6,750s.f. of slab on grade, 76,000s.f. 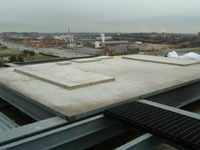 of slab on metal deck, 1,000s.f. of elevated structural slab and miscellaneous site concrete. 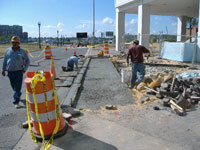 The total yardage of concrete was 1,550c.y. The project consists of 190c.y. of concrete footings/piers, 195c.y. of walls and grade beams, 25,000s.f. of slab on grade, 76,000s.f. of slab on metal deck, 900s.f. of elevated structural slab, 2000s.f. of sidewalk and 4000s.f. of concrete pave base. 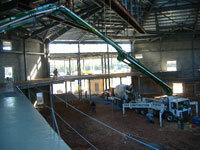 The total yardage of concrete was 720c.y. The project consists of 1000l.f. of concrete saw cutting, 20 loads of debris hauled off site, 100c.y. 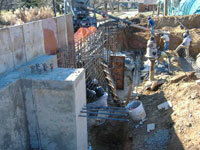 of concrete footings/foundation walls, 13,000s.f. of scored concrete patio, 1,000s.f. of sidewalk, 600l.f. of curb & gutter, 4000s.f. of brick paver re-installation and 4,650s.f. of rigid foam fill. The total yardage of concrete was 380c.y. The project consisted of 27 small task order projects. 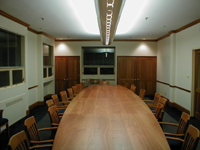 The work included renovations of Founders Hall conference room, main lobby and projection room, North Hall Principal’s office, administrative office and student commons, South Hall carpet repairs and the Athletic Building boy’s locker room. Installation of 5 support beams on the stadium grand stand was also included in the work. The project consisted of 4,630 s. f. of 4″, 6″, 8″ and 12″ interior CMU walls, 2000 s. f. of concrete placement for plumbing trench pour-back, formwork and placement of 10 c. y. of concrete for 5 drainage pits and a 600 s. f. slab on deck for a roof top boiler room floor. The work was completed for HITT Contracting. Minor masonry and concrete demolition, as well as, installation of 17 door frames were also included in the scope of work. 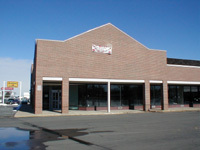 The project consisted of a 6000 square foot retail space. The space was completed for Seneca Properties and is the future home of Five Guys Burgers & Fries, Fantastic Sam’s Hair Salon and a T-Mobile Retail Outlet. 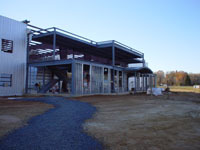 The work included demolition, wall framing, drywall finishing, installation of new doors and ceramic tile flooring, and installation of the mechanical, electrical, and plumbing systems for the building shell. The project consisted of placement of 6,891 square feet of slab on grade sidewalk and 4,421 square feet of 2” topping sidewalk. 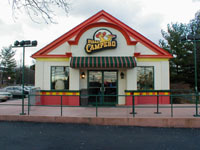 The work was completed for Interstate Construction and Development. Masonry brick and block for an ATM enclosure and column piers were also included in the work. 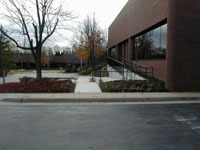 The project consisted of demolition of an existing single slope walkway ramp and installation of a new two-tier ADA handicap ramp. The work was completed for HBW Group. Relocation of an in-ground sprinkler system and raising two sanitary waste pipe cleanouts was also included in the work. The project consisted of 327 square feet of masonry walls and 2 cubic yards of concrete footings. The work was completed for HBW Group. Minor masonry and concrete demolition was also included. 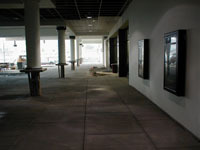 The project consisted of a 2000 square foot retail space. 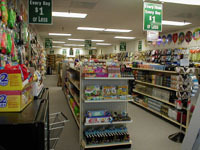 The space was completed for Seneca Properties and is now the home of the Manassas, Dollar Dollar Store. The work included demolition, wall framing, drywall finishing, installation of new doors and flooring, and installation of the mechanical, electrical, and plumbing systems. 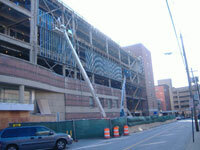 A new 6 ton rooftop HVAC unit was also part of the construction package.